We’re all entitled to make mistakes. Even though I helped set the schedule, I went on memory and thought the dessert we were making for French Fridays with Dorie this week was the cheesecake tart. Turns out that it’s Waffles and Cream. Think of this as a preview. I’ll make the waffles when I get chance, but I might wait until the week everyone else is making the cheesecake tart. We’ve been friends for a while now. So I’m comfortable telling you how it is. I am an adventurous eater, and there is little I won’t eat. There is one food, however, that causes me to have a visceral reaction of revulsion. I only have to think of it, not even actually see this food. Can you guess what it is? Well, I’ll tell you. It’s cottage cheese. I don’t know what it is about it. I think it’s the curds. Ricotta doesn’t bother me, or fresh goat cheese, or farmer’s cheese, but I simply cannot deal with curdy cottage cheese. That’s just the way it is. This week, I made the cheesecake tart recipe for French Fridays with Dorie. The main ingredient is fromage blanc. Fromage blanc is a fresh low-fat cheese with a soft texture like crumbly cream cheese or farmer’s cheese. It’s not a common grocery item, but knowing that the recommended substitute was cottage cheese, I knew that I had to find the real thing. I was looking for Vermont Creamery’s version of fromage blanc because I’ve seen it around. Instead, I found one made at Nettle Meadow Farm in the Adirondacks of New York State. (Cher, do you know the farm?) 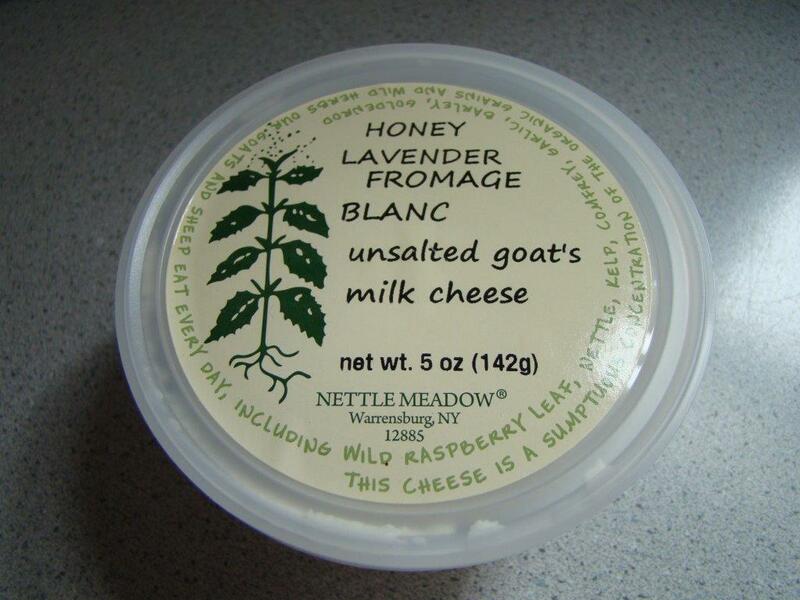 This award-winning fromage blanc is made from goat milk and flavored with honey and lavender. That seemed perfect for a dessert. I love how the package lists the different plants the goats forage on! If you can’t read the label, it says: “This cheese is a sumptuous concentration of the organic grains and wild herbs our goats and sheep eat every day, including wild raspberry leaf, nettle, kelp, comfrey, garlic, barley, goldenrod”. I minified this one: one third of the recipe to make 2 mini tarts. One with dried fruit for me, and one without for Howard. The tart starts with Dorie’s Sweet Tart Dough. This pastry is one of my favorite recipes in Around My French Table. I always press it into the pan, no rolling required. And the result is like a shortbread cookie base for whatever delicious filling you choose. For the cheesecake tart, the creamy filling is made from processing the fromage blanc and the other ingredients until it’s smooth. A slurry of cornstarch and milk helps thicken it up. First, you sprinkle a spoonful of dried fruit (I had a medley of golden raisins, cranberries, cherries, and blueberries) on the bottom of the tart (or not, for Howard). Then, you pour in the filling and bake it until it puffs up. Once cooled, all it needs is a sprinkle of powdered sugar before serving. When I said I was making a cheesecake tart, Howard stopped listening after I said “cheesecake”. He was imagining a New York Cheesecake, not a French one. Once he got over the initial disappointment, we agreed that it was good, not too sweet or tart or heavy. We both liked It, though next time I’ll surprise him with that New York Cheesecake. You’ll have to wait until next month to find out how the other Doristas’ cheesecake tarts came out, but if you’re interested in their Waffles and Cream, check out their links here. 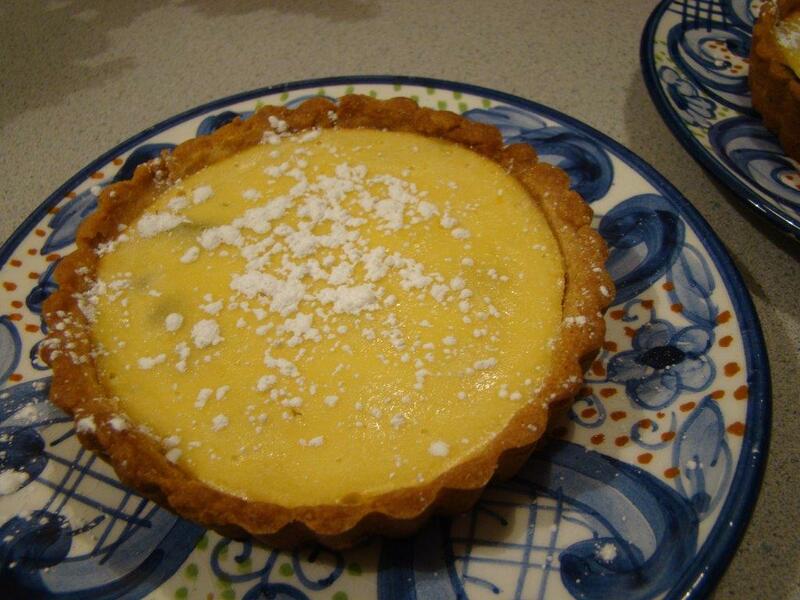 The cheesecake tart recipe is in Dorie Greenspan’s book Around My French Table. Posted on 3 April 2015, in Baking, Cheese, French Fridays with Dorie and tagged cheesecake, desserts, French Fridays with Dorie, tart. Bookmark the permalink. 16 Comments. Thanks for the preview ;) I think Bill will go for this–sans fruit, of course. I will have to start the hunt for fromage blanc soon! I do know if that farm – they sell some of their products at a couple of co- ops. I am glad you gave is the preview. Now, I need to start hunting down fromage blanc. Ooooh, I look forward to making this one! Betsy, I feel the exact same way about the exact same food. There are very few things I won’t eat and cottage cheese makes me shudder. Blurg. I also do like ricotta, so I’m with you and am glad to have found a fellow cottage cheese hater! Thanks, also, for the heads up that I’ll need to search out some fromage blanc in these parts as well. Wow! This looks luscious! My kind of tart! Thanks for the pre-view, Betsy…even though it wasn’t intentional! I think I would sub ricotta instead of cottage cheese, that is if I couldn’t find the fromage blanc. This tart reminds me of an Italian Easter pie that I make each Easter. LOL I love how “minified” has just become a part of our vocabulary over at FFWD! These look good and you’ve reminded me to get hunting for that fromage blanc…. Thanks for the preview – excited for this one! I’m looking forward to doing this one. Thanks for the preview! Yum! I wanted to jump right to this one, too! I love your quest for the perfect cheese – and the one you found sounds perfect for a tart. 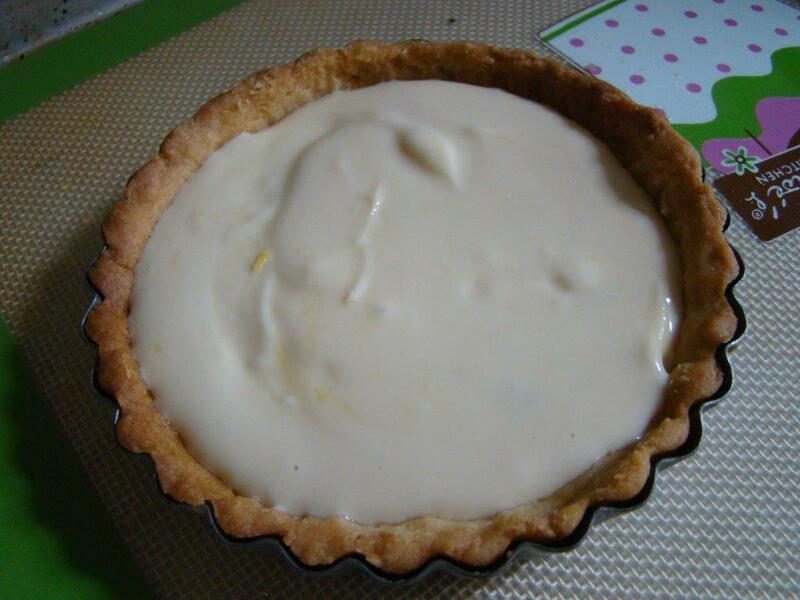 I love Dorie’s sweet tart dough for the same reason as you – it is my go to tart dough recipe. After reading this pist, I am excited to make this recipe – it sounds like my kind of thing. Happy Easter! I just made this tart too, only because it’s almost Easter. I found the Vermont Creamery’s Formage Blanc it was terrific. This was really interesting. I wouldn’t call it a cheesecake either because you know I am a fan of Junior’s. Betsy, you and I agree on almost everything but, regarding cottage cheese, we walk different paths. I love it. Large curds only. Full-on flavor, not low-fat. (BTW, it’s very difficult to find Large Curd cottage cheese these day. Thought you would want to know.) I’ve posted two wrong recipes during my FFWD tenure. Going on memory is not a good thing, I guess. I needed an easy peasy recipe this week because of my road trip. Plus, no waffle maker at chez Hirsch. 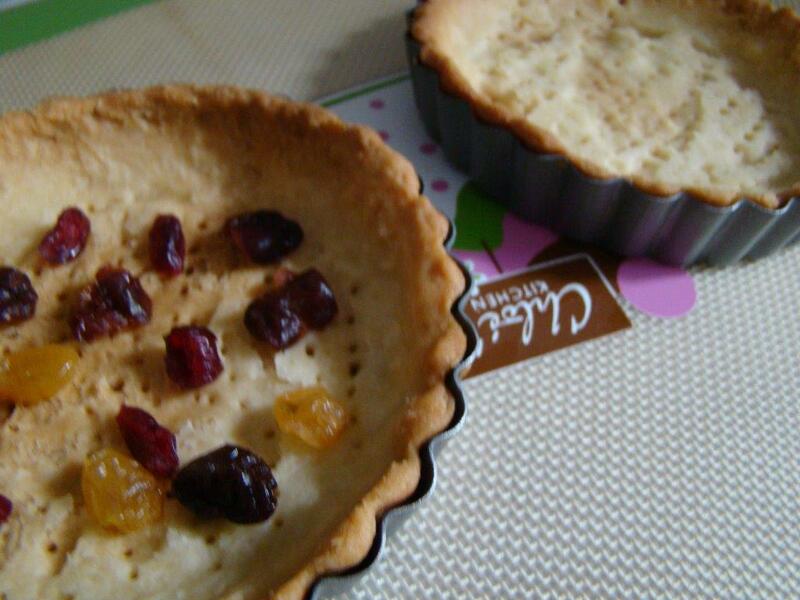 Your cheesecake with and without dried fruit looks delicious. And, for me, individual tarts are the way to go. Dear Betsy, what a wonderful product (fromage blanc) you used in your recipe – just like something I would buy, actually, exactly what I would chose for my Cheesecake Tart as well – I also love it when the label states what the animals feasted on – around here we often find that on dairy products and honey…love it when people put these wonderful products to a delicious use like you did – your mini-tarts look like a perfect Easter weekend treat! I am now looking forward to making this recipe and you inspired me to go visit my favorite goat farm again. Betsy, you had me giggling at your remark at husband imagining NY cheesecake and not the French kind. It’s true that they are very different and funnily enough, it’s becoming trendy for Parisian Patisseries to feature NY-style mini cheesecakes so you are right on here! Looks great and can imagine it tastes absolutely delicious. I too cannot stand cottage cheese, so I think I will make the effort to hunt down fromage blanc. One of my earliest memories of my husband (from a couple years before we started dating) involves him eating large quantities of egg salad sandwiches made by mashing hard boiled eggs and cottage cheese together. I also hated hard boiled eggs at that time, and couldn’t think of a worse lunch! I think the fromage blanc you got looks wonderful. I don’t mind cottage cheese, but I’d have much rather had a container of that lavender and honey fromage blanc. And the sweet tart dough is one of my favourite Dorie discoveries.